When I was studying for my MA in Children’s literature at Macquarie University, I was introduced to metafictive picture books, which I had not come across before. I fell in love with their quirky and boundary breaking style. 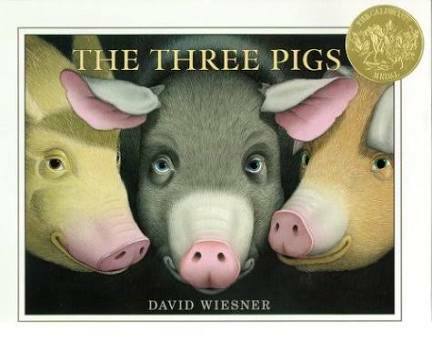 The Three Pigs by David Wiesner was my favourite, with its frame breaking pigs running through other stories and making up their own. It is such a freeing and liberating idea. I think it appealed to me as a social worker as a metaphor for life – we don’t need to be bound by the narrative of our past but we have the power to choose how we live our own life. Handy hint: study and courses are helpful to expose you to new ideas and ways of thinking, and introducing you to concepts you never knew existed. 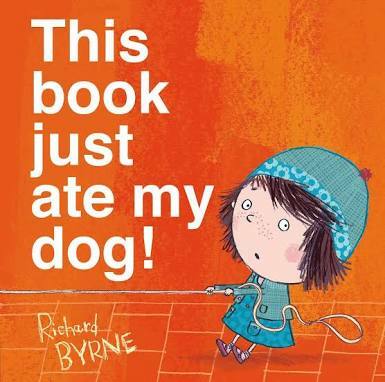 I was browsing picture books in a bookshop (as you do) and came across This Book Just Ate my Dog by Richard Byrne. Its hilarious use of the book’s gutter to swallow the dog (and rescuers) really appealed to me and had me laughing out loud in the aisle. Again it’s that quirky use of the book’s construction that appealed to me and I knew after reading it that I wanted to incorporate the gutter of a book in my writing – and in The Scared Book, it’s where the monsters emerge from. Handy hint: read widely and support your local bookshops. This last one helped me with some of the specifics to refine the manuscript. I had the idea for the book and things that happened to it in my mind but I needed inspiration about how else the reader could manipulate the physical book. I came across a social media game initiated by a publisher that I respected and followed. They had an Instagram challenge to post a book a day on a certain theme. So I signed up to Instagram, being a bit late on the up-take to this social media platform (even now it’s not my favourite). 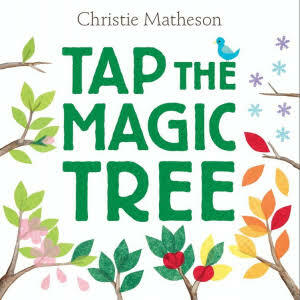 A few people posted and raved about Tap the Magic Tree by Christie Matheson and I was fascinated – I had to find out more and I was so happy to find it being read on YouTube! It gave me some more ideas about what actions could be brought to bear on a book. Handy hint: use social media and be connected to an online community. 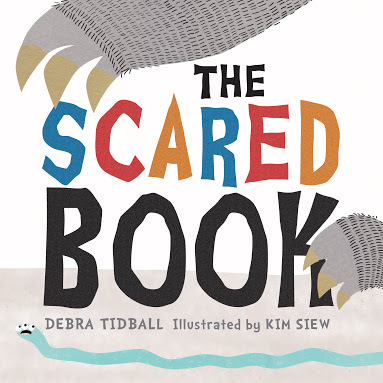 A few people have described The Scared Book as being in a similar category of interactive books as Herve Tullet’s Press Here, and I can see why. Perhaps it had seeped into the periphery of my mind, but it wasn’t until after I had submitted my manuscript to the publisher that I was given Let’s Play, to review for CBCA Reading Time that I got to look inside one of his books. For your chance to WIN a signed copy of The Scared Book comment below or on social media with your response to “What gives you goosebumps, spine tingles or butterflies in your tummy?”. PLUS, for a chance to PITCH and SUBMIT your picture book manuscript direct to publisher Suzanne O’Sullivan at Lothian Children’s Book, add #thescaredpitch to your response! Thanks Katrina – it was actually an EK challenge! Fab post Deb, love reading about your PB inspirations (and so want to read This Book Just Ate My Dog!). Thanks Liz – you simply must, its so funny! Yes – that has been a fear of mine for some time!! Thanks Zoe, glad you enjoyed it – so many great books, so little time! Additionally, Press Here is a fabulous book, what a great compliment to be placed in the same category. Thanks Kaye. Enjoy Melbourne – I hope there are no more hair raising moments 🙂 and thanks for your support! Loved reading about the way other books inspired the creation of this one, Debra! I found my ‘picture books’ unit in my MA was similarly helpful and loved studying the post-modern influences in PBs. “What gives you goosebumps, spine tingles or butterflies in your tummy?”. Cockroaches in the shower! Most specifically cockroaches crawling up my leg in the shower… eeeewk!